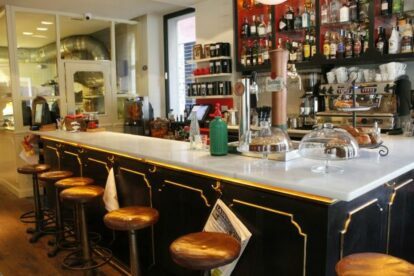 Located on the edge of the El Born neighbourhood, Elsa y Fred is probably not the kind of restaurant you pass by coincidentally. Well, that’s what you have me for: to direct you to this super cute place. Named after a romantic Argentinian movie, Elsa y Fred, the place gives me the feeling of entering a living room from many decades ago. It is very cosy and – just like the movie – kind of romantic. They serve delicious tapas and as they call themselves a ‘gastro bar’ you can expect those classics with a twist. However, despite my first great experience here at night. they got me totally hooked as a regular for their brunch. And when I go there I always have the feeling to spend my lazy weekend morning with the other neighbours of that area. Sipping their coffee, reading a newspaper or chatting with the lovely girls of the staff – who wouldn’t want to start the weekend with a relaxed vibe like that? The brunch menu is only served in the weekend, and it is to die for! It offers many varieties of eggs and pancakes. The portions are not too big and perfect for breakfast if you ask me. During the week they also offer breakfast and they have a ‘menu del dia’ that varies daily for a great and affordable lunch. Even in the weekend they accept reservations for brunch, so there’s no stress over finding a table here to enjoy a lazy Sunday morning!